, son of the preceding, wa; born in Oxford July 15, 1656; and after being educatea in grammar-learning, was bound apprentice to a bookseller in St. Paul’s church-yard, London. But he was soon called thence on the death of an elder brother, and entered a gentleman-commoner of University-college in 1672; where, as Wood informs us, he became idle, a great jockey, married, and spent a considerable part of his property; but afterwards restrained his folly, and lived some years a retired life, near Oxford, employing his time in researches into thejiistory of dramatic poetry. 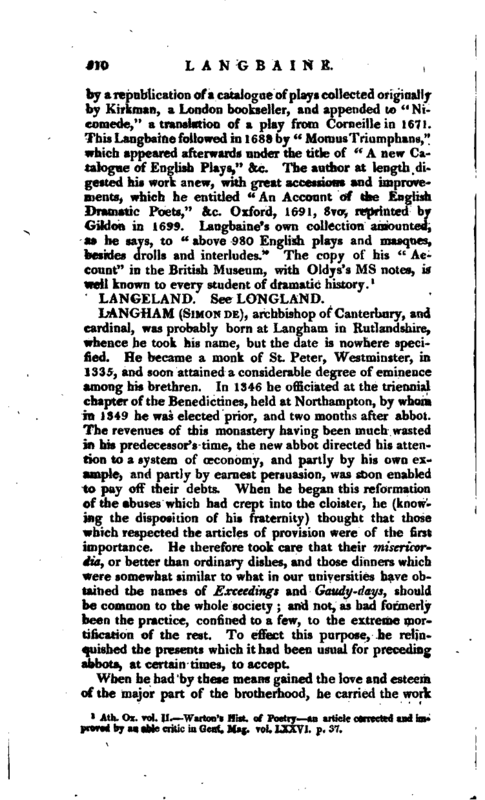 His literature, Mr. Warton says, chiefly consisted in a knowledge of the novels and plays of various languages, and he was a constant and critical attendant of the play-houses for many years. Such a pursuit was at that time neither creditable nor profitable; and accordingly, in 1690 we find him glad to accept the place of yeoman beadle of arts, and soon after he was chosen esquire beadle of law, probably out of respect to his father’s memory. Ath. Ox. vol. II. 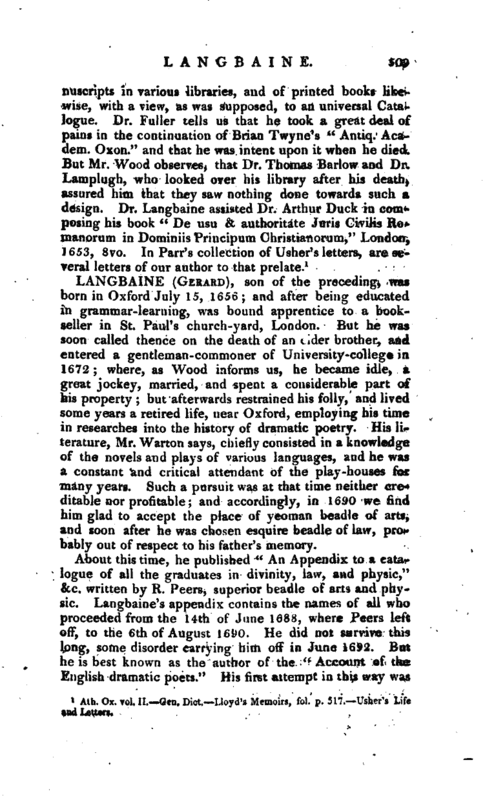 Warton’s Hist, of Poetry an article corrected and improved by an able critic in —Gent. Mag. vol. LXXVI. p. 37.